We realize the result of the 1988 massacre. Toda, we have heard a message of hope. Nothing is ever going to stop you in your Mach toward democracy. Women have huge role for bringing about democracy in Iran. We should pay tribute to Mrs. Rajavi for her efforts to champion this role for women. 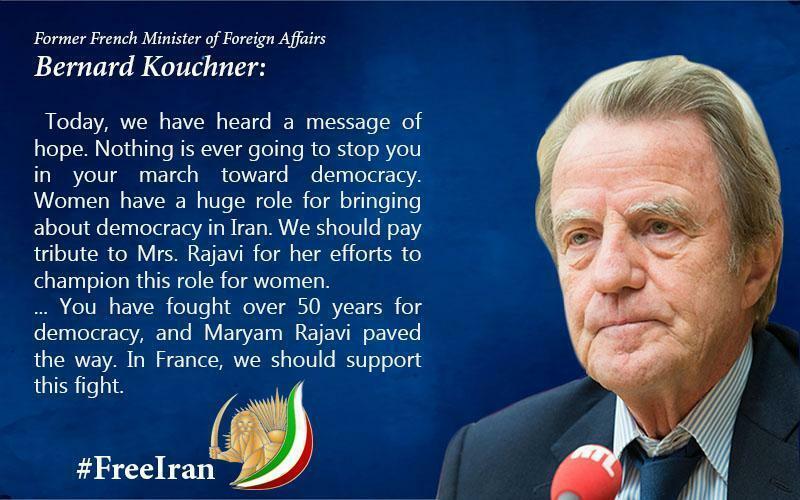 ……You have fought over 50 years for democracy, and Maryam Rajavi paved the way. In France, we should support this fight. 33,000 people. And we wonder what the International Criminal Court in The Hague, or all the courts which were formed about specific massacres, in specific countries, like the Russell Tribunal and the tribunals about massacres in Rwanda, in Lebanon, etc. And we absolutely need the creation of a specific court, to avoid being told that the massacres happened too long ago and that’s it’s too late, there’s prescription.